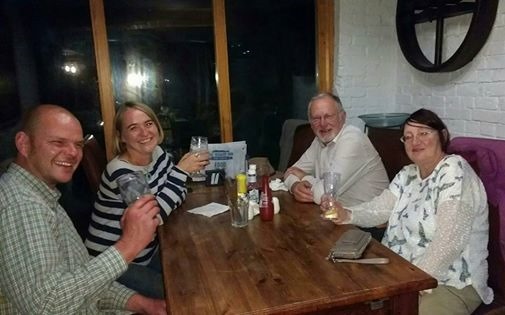 As predicted we celebrated Joy’s birthday at The Wharf Inn, the pub was really busy for a Wednesday evening and we had to wait for a table to become free. 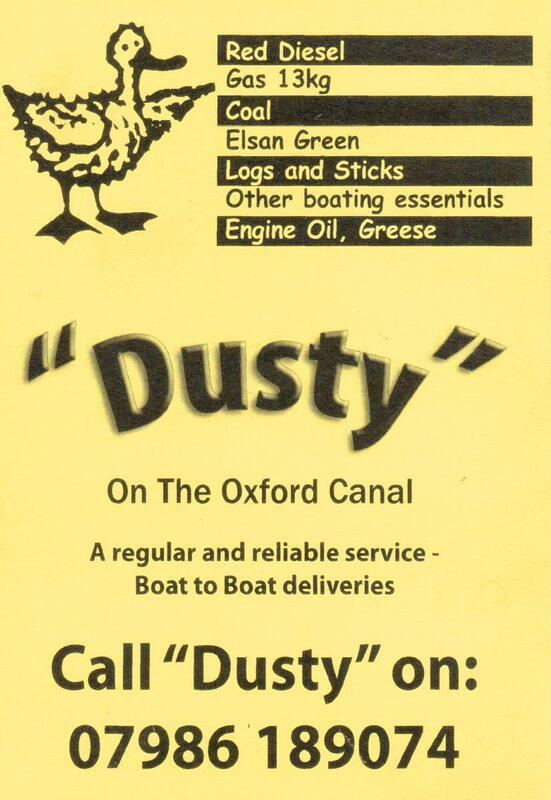 We were in good company though as we were pleased to be joined by Jock & Ali from Dusty the coalboat who had arrived a little earlier and were waiting for their diesel & coal delivery to arrive the next morning. 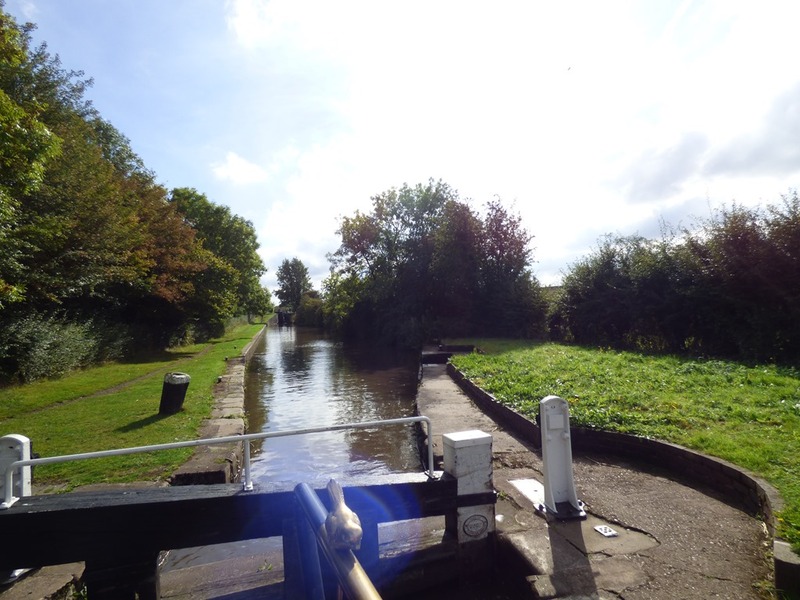 Their delivery arrived bright and early so we were able to relieve them of some of it before we left to negotiate the twists & turns of the summit level of the Oxford Canal before descending the Napton Lockflight. There was a bit of a queue at the top and we slowly followed a hire-boat with a crew of Americans down, they had obviously been told the open the paddles a bit at a time but not remembered (or been told) that this didn’t really apply going down locks. At the entrance to the Engine Arm we met another hire-boat which had taken a wrong turn and come up seven locks only to have to go back down again! 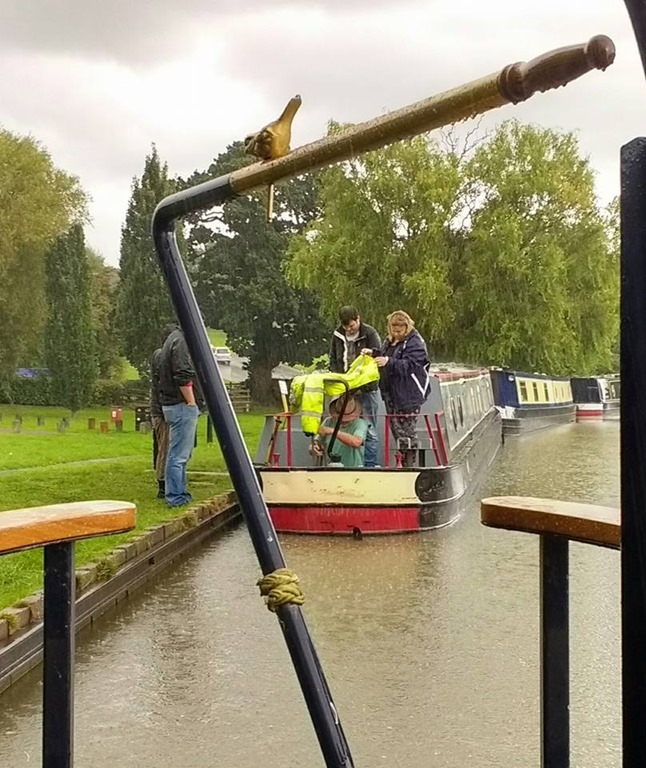 The volunteer lock-keeper was keeping an eye on them to ensure the didn’t miss the turning point and have to go all the way to Fenny Compton which is the next winding hole. We moored for the night on the ‘temporary’ 48 hour moorings just before the last lock. On Friday we were away soon after 8 am as we wanted to get to Rugby before the rain that was forecast for Saturday arrived. All went well until we arrived at about 4 pm (a long day for us) and then the heavens opened just as we were looking for a spot to moor. There was a boat using the facilities opposite and then a hire-boat came along and moored on the water-point. It transpired that the hire-boater had got a mooring rope tangled around propeller so when the first boat moved off I moved across and untangled it for them. I got drenched to the skin, but I was pretty wet before and they were very grateful … still, we did get a mooring to sit out the rain on Saturday! In fact we went into Rugby town centre Saturday morning, courtesy of our bus passes, where we dodged the showers and bought some veggies in the market. There was a food fair on in the churchyard where we bought some chilli jam sausage rolls for our lunch before returning to the boat to watch the rain. Sunday brought the sun out again and we had a shorter day ending up at Hawkesbury Junction. On the way, as we were following the railway line we heard a chuff-chuffing approaching. Not a steam train but a steam boat! SNB Laplander was built as an Birmingham Canal Navigation ice breaker in about 1830, later fitted with Bolinder semi-diesel engine. Converted to steam by owner. (c1980-c1986) fired not by coal but burning a 50:50 mix of kerosene and waste oil. Monday’s target was Hartshill, so we could tackle Atherstone Locks the next day, we stopped there for lunch and let Catty out for a ramble but the stench from the nearby ‘animal by-products’ factory was so foul that we moved on as soon as she returned. We thought we would stop before the locks but there wasn’t a space to be had, so we thought we might moor outside the Kings Head and eat there but but someone else had bagged that spot. So we found a space just past the bridge with the A5 to one side and the West Coast Mainline on the other, we must have been tired because it didn’t disturb our sleep! So it was down the remaining six locks on Tuesday morning arriving back at our mooring in less than two hours and spent the afternoon catching up with local news from our neighbours, dealing with almost two months worth of mail and placing a grocery order with Morrisons for delivery tomorrow. Since we’ve been away the MoT has run out on the car so have to get that done on Friday. So that’s our cruising done for another year, better start planning for next year now!